Kreg is coming out with a new custom Pocket-Hole plug cutter (KPCS) in the first part of November 2016. With this plug cutter you can cut pocket hole plugs out of the same wood your project is built from. You can already buy custom plug cutters from other companies, but this official pocket-hole plug cutter from Kreg works right in the K3, K4, and K5 Kreg pocket hole cutting jigs. This enables you to use the same pocket-hole drilling setup you already have (dust free in the case of the K5) to make the matching plugs. The plug cutting guide is made from impact-resistant glass-reinforced nylon and has hardened steel bushings. The cutting guide will work with the included standard plug cutting drill bit, as well as with the HD and Micro plug cutting bits that are sold separately. The tip of the bit shears the wood fibers, and they have fluting to reduce friction and minimize the heat generated. The bits also have a stop collar to control the depth of cut, similar to pocket hole drill bits. All this contributes to better looking plugs and longer tool life. The Kreg pocket-hole plug cutter is set to cost $70. If you pre-order it now from Peachtree Woodworking Supply, you can get free shipping and it should ship the week of November 7th, 2016. 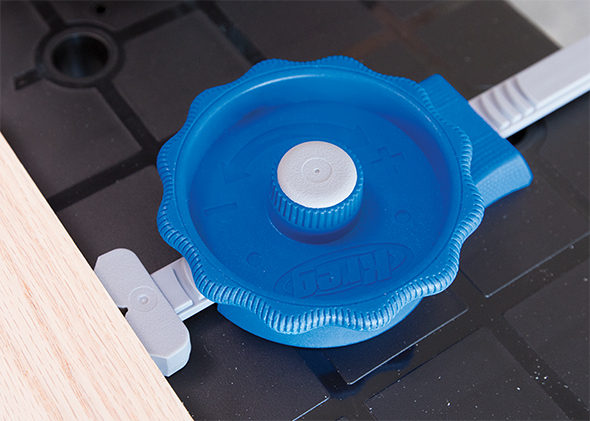 Yes this post is a little late and we missed the $25 off pre-order deal at Peachtree, but I initially hadn’t planned about posting about this new Kreg custom plug cutter. Then I started thinking about why people plug pocket-holes. I personally have never plugged a pocket-hole, because I either put them places where they will be hidden, or use them on shop fixtures where I don’t care. I’m not a fine joinery snob that thinks pocket holes shouldn’t be use in furniture, but I generally think that if you are going to put any kind of stress on the joint you probably should use a better method because a glued end grain joint won’t last. But there are cases where I suppose plugged pocket holes make sense. Take our bedroom set that we purchased years ago. It uses pocket hole joinery on the headboard and foot board to hold the rails and stiles on the paneled field together. While the pocket holes are inconspicuous, they aren’t plugged. When I notice them making the bed, they bother me. It would have taken almost no added effort at the factory to put plugs in the holes. So my question to the pocket hole users out there: Do you use pocket-holes in situations where you plug them? And do you buy plugs or make them yourself? 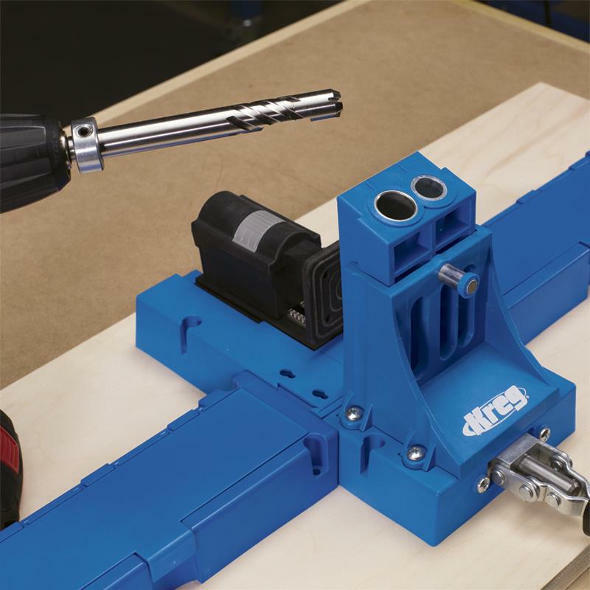 I have a Kreg jig and have used it infrequently. As of this writing I have not used any plugs. However, Should the need arise, I probably would just purchase what I needed. and provided a link to an alternative one (bit only) sold by Woodworker’s Supply. I agree with your comments that plugging pocket holes is generally superfluous – because they are most often hidden – so this set (or the full set that adds bits for mini and HD sizes – might not get a lot of use. I’ve used pocket hole technology for almost two decades but I have never plugged a hole. I’ve always found a way to hide them or cover them in a way that blends better then plugs. I have covered a few just to do it once – the plugs didn’t exactly match the wood but the color/tone was close enough – and they were mostly hidden anyway. IE – inside computer desk I made – where they showed when you opened the drawers or open the door – I covered those. the ones in the back – no dice. ordinarily I don’t cover them. I should have added. and I’ve only ever done it once. would be nice to have the ability to cut your own plugs but I probably won’t. I might be interested in this at a lower price. I used plugs on some stained shelving a couple of years back. The plugs held on 1×2 nosing on 3/4 plywood shelves. They are on the underside, so they are pretty inconspicuous, but they are visible from some angles. I bought the maple plugs from Kreg, but the match isn’t perfect. I’d consider this tool if I had a big project coming up. I decided that if the piece was to be painted, I would just use normal 3/8″ dowel (or in my case 10mm then skimmed to 9.5mm using the Veritas Dowel Former). If it is a show piece, then I will cut square strips to match up the exposed grain and cut them to length on the bandsaw using a simple jig. I think at maybe $30 I would consider this but almost all my pocket holes are hidden so probably not then. (Other Nathan here) I tend to use pocket holes a lot for joinery, due to the simplicity. However, I’d add, as others have, that there are not a lot of instances where I want or need to plug the holes. Every so often, I get in a hurry and find that I’ve drilled a pocket hole on the wrong side or assembled a 1×2 backwards, and it’s easier to plug the hole than to redo that piece (I don’t do a lot of fine furniture). In the case where I might need to plug, it is handy to have the precut package of plugs from Kreg (usually oak or pine), which would limit this device’s use for me. I guess if you used exotic wood and were clumsy and/or planned your design poorly, then this might come in handy. 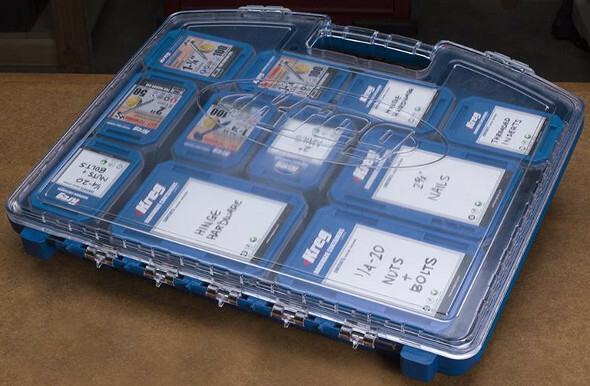 I saw Menards clearancing out a bunch of Kreg hardwood plugs last week…. Now it makes sense. I wonder if I can use this with my porter cable quik jig? 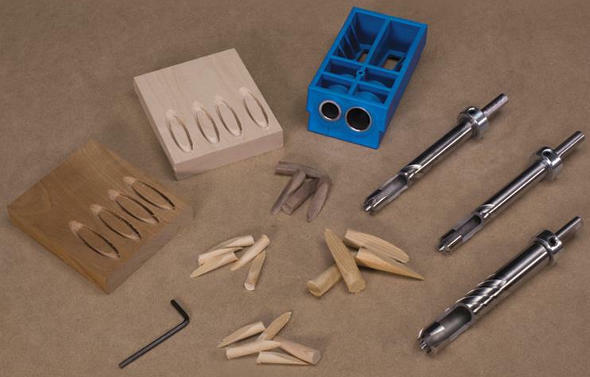 This is another instance where I Don’t understand why Kreg didn’t also have a straight jig as well. In this in particular, a with straight jig, you could make dowels too which would double the feature set. There have been instances where I wish I could use a Kreg jig and the standard drill bit and make a recessed perfectly sized hole for use of their screws perpendicular. I understand you could do it freehand, but a straight jig would help with any wobble / skewness and need for going back to the drill press. I use my kreg jig probably weekly, and I plug about 75% of the holes. I buy the plugs (in bulk) but would much rather make my own since I keep all my scrap wood. I’ll be looking into one of these around father’s day (fingers crossed for a sale).